Not long ago I read Vanessa Chapman’s post about bloggers losing their mojo. Our short interaction got me thinking because the Blogging Blues are real! Regulars here know that I’ve been blogging about 6 ½ years (an anomaly) – and the archival record shows I’ve been fairly regular. There are times when personal, family, medical, or work issues take a blogger away from their normal routine, but as a whole, I’ve been a faithful steward of my little corner of the world. Nonetheless, the Blogging Blues are real … and I know I’m not immune to them! One can trace some symptoms of the Blogging Blues back to this question: Why do you blog? The collective reasons are many, but only the host blogger can answer this important question, and they must answer for themselves. Maybe – just maybe, the cure for the Blogging Blues lies in the answer to that question. I enjoy sharing and interacting with others. Given the type of posts I do, I obviously also enjoy researching. My eclectic nature helps me to avoid ruts. I see this blog as a weekly magazine that releases one article per day, then the patterns repeats the next week. However, the Blogging Blues are real … and I am not immune from them! Can you say that to yourself? Come on … try it. Publishing frequency can factor into the Blogging Blues. Each blogger faces the frequency question differently – and that’s OK. Schedules are a double-edged sword because while providing a rhythm, it can also be a burden on the blogger – a heavy burden of obligation leading to a self-imposed pressure – thus easily leading to a case of the Blogging Blues. The solution is easy to say, but for some bloggers, hard to do. It took me several years to overcome this pressure, but I’ve learned not to force a post. It’s OK to miss a post. Repeat after me – It’s OK to miss a post. Because of my posting frequency, I had to streamline my approach in order to relieve blogging pressure. That is, if I wanted to continue a certain pattern, I had to streamline my approach into something manageable at the blog end while balancing my blogging life and my life outside of blogs. Monday Morning Entertainment, Satire Bits, and Opinions in the Shorts are examples of posts requiring less effort than a deeper topic. Even with this approach, I maintain that it’s OK to miss a post. I’ve also learned to reduce on my posting schedule when necessary. Although my posting goal is 6 per week, if I have to reduce to 2 or 3 per week, I’ve learned that it is OK – so I tell the regular readers because they appreciate knowing. Say this loud – Blogging breaks are good. Say it again, but this time with some gusto – Blogging breaks are good! Blogging breaks are times away from your blog. They can be planned or unplanned, and for many possible reasons, including giving yourself time for whatever. 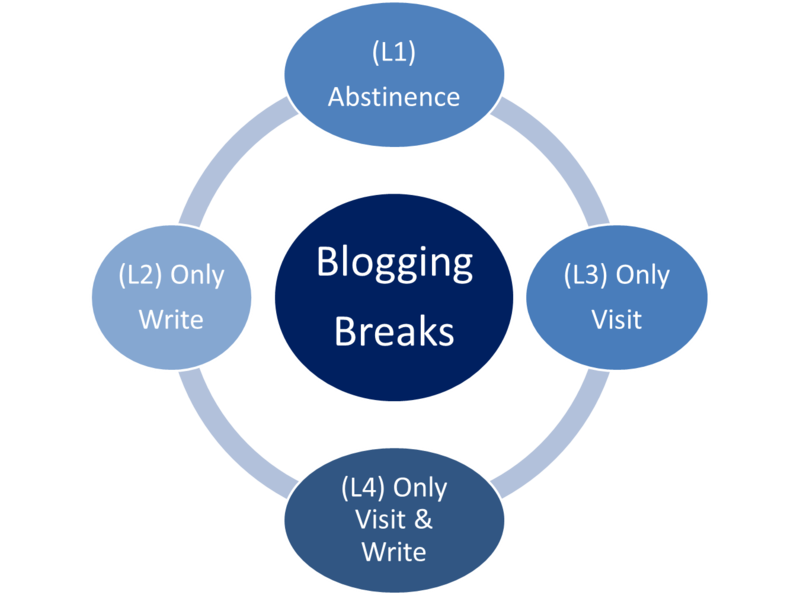 To me, there are four levels of blogging breaks. Level 1: Complete removal of yourself from blogging for a designated time period. No posting, no writing, no visiting … nada, zilch, absolutely nothing. Stay away and don’t worry about it. But as previously stated, tell your community about your upcoming absence. Level 2: Similar to Level 1 because you have no online presence. However, you spend your time preparing posts. Level 3: No posting, but you spend time visiting and commenting on other blogs. This keeps you connected, provides time to reconnect with old friends, and make new connections – and this may be a re-energizing experience and even spark an idea or two for your future posts. Level 4: Similar to Level 3 because of your online absence, but you are drafting future posts. After all, writing is a process and some of us like to have drafts in the queue. Meanwhile, you are still in contact with your community and potentially expanding it. Regardless of the level, blogging breaks are good, and bloggers should use them as a way of preventing the Blogging Blues. As a matter of fact, a calendar year should include multiple breaks at different levels. Here are some of my secrets to blogging longevity. None of us are immune to the Blogging Blues because they are real. Do you have any suggestions for the Blogging Blues? Let’s close with something for music lovers … that is, a touch of the blues that may make you smile … but I’m not the breeze. Enjoy. 4) I wasn’t consider a troublemaker, but this strange night happened during my senior year. 16) Blogging here for the past 6+ years (since August 2008), and I’ve grown to appreciate goodness of so many good people across the globe. I imagine many sports fans are like me – that is having one team – that is having one team they detest under any and all circumstances. Instead of many, it may even be most sports fans … but I’m confident this isn’t true for all. For me, it’s the University of Kentucky (UK) – especially in basketball. After all, I’m unhappy even when they lose. I can honestly say that their fans drove me to that point because I find UK fans to be arrogant, condescending, blind, self-centered, and more uncomplimentary adjectives. I know that UK fans haven’t cornered the market on that behavior. After all, a large school in the center of my state exhibits similar behavior regarding a ball of another shape that bounces funny. I’m confident that my statement isn’t true for all UK fans – and I’m unsure if most qualifies because I don’t have the numbers to support the statement. Yet, I find many is a good descriptor because being a relative term and a bit vague. After all, on first thought a million is many, but is it when compared to a billion? However, this post isn’t about sports or the University of Kentucky because the above sets the stage for my experience and point. 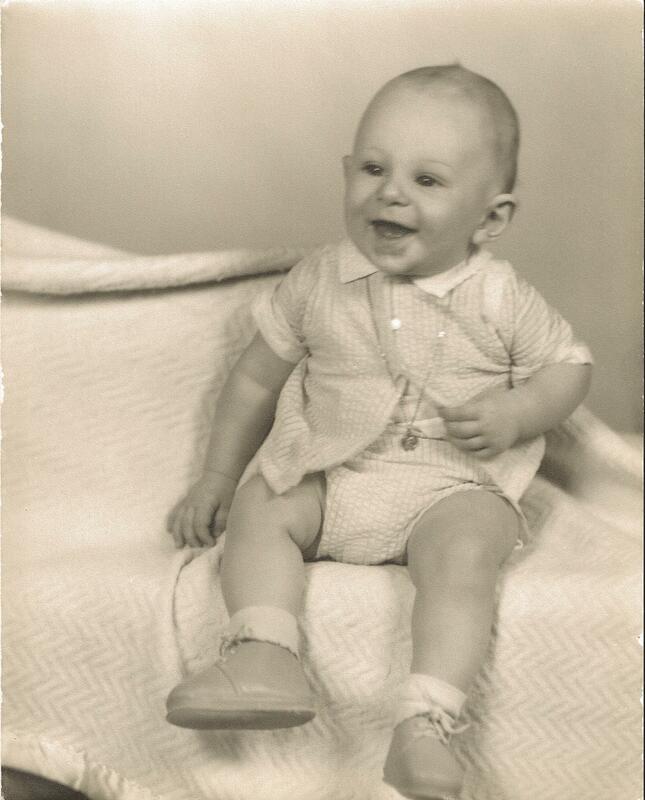 Sometime in January 2014 I was reading a humorous post about the start of a new year. It was quite amusing and very well done … well … until reading one important sentence. In the blogging world, I tend to take the high road to avoid confrontation, so I didn’t comment – but the statement kept festering in my mind – so I returned to add my thoughts to the comments section. My comment wasn’t disrespectful to the host – not even snarky – but I made my point in a respectful manner, and the host reciprocated the same way. We exchanged several comments, and in the end, while agreeing to disagree, I moved on … and yes, I have returned since the encounter. To me, at issue was the word all – a word that is quite inclusive. Because many or most wasn’t used, I don’t positively know that my reaction would have different, but because I focused on all, I’m confident that my reaction would have been different. Is there a difference in using many, most, and all? Is blog writing so informal that we should overlook the use of these descriptors?